Three Rotary women were recognized on 7 March at the World Bank in Washington, D.C., USA, for their commitment to improving lives through innovative humanitarian projects. 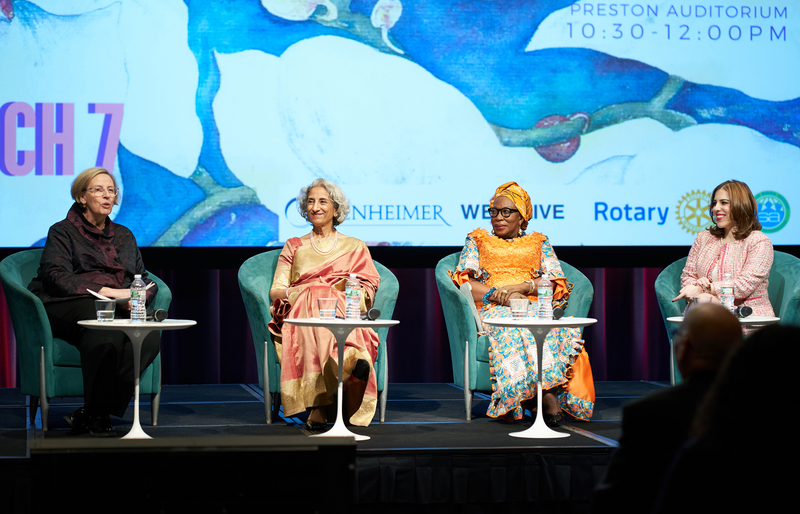 The celebration, hosted by the World Bank Group Staff Association, and sponsored by Rotary International and investment firm Oppenheimer & Co., was one of many events held this week to mark International Women's Day, which is on 8 March each year. It highlighted the positive changes women make around the world. Annette Dixon, vice president of the World Bank for South Asia, moderated the event. Dr. Geetha Jayaram, a member of the Rotary Club of Howard West, Maryland, USA, addresses mental health issues for poor women in developing countries. Danielle De La Fuente, a member of the Rotary Club of Coronado Binacional, California, USA, shares how her organization, The Amal Alliance, empowers refugee children around the world. Marie-Irène Richmond-Ahoua, past PolioPlus chair for Côte d’Ivoire, talks about the strides Africa has made toward becoming polio free. Speaking to more than 300 people, with thousands watching the livestream, Dr. Geetha Jayaram, Marie-Irène Richmond Ahoua, and Danielle De La Fuente, all Rotarians, told their stories and explained how their work helped poor women in India gain access to mental health care, vaccinate hundreds of thousands against polio in West Africa, and empower refugee children around the world. "These are women of action who are making a huge contribution to the world," Dixon said. "They have given a lot of themselves to their initiatives and are playing a leadership role for many women." Jayaram, a member of the Rotary Club of Howard West, Maryland, USA, and a recipient of the Rotary Global Alumni Service to Humanity Award, told the audience that her mental health clinic has provided nearly 2,000 poor people, mostly women, each year with comprehensive care in more than 200 villages in southern India. The Maanasi Clinic, founded by Jayaram, has been recognized by the World Health Organization for its effort to advance mental health care in developing countries. Its services also focus on vision, hearing, geriatric care, and vocational rehabilitation. The clinic, which operates in partnership with St. John's Medical College, has received funding from the Rotary Club of Columbia, Maryland, and Rotary grants. In total, the clinic has reached nearly six million housholds since it began in 2002. "I never expected I would feel so fulfilled and gratified by these women who have so little, who will welcome you in their home and share their most intimate details of their lives," Jayaram said. "That is a large gift to me and our workers." Marie-Irène Richmond-Ahoua, a member of the Rotary Club of Abidjan-Bietry, Côte d’Ivoire, talks with audience members at the International Women’s Day celebration at the World Bank in Washington, D.C., USA. Marie-Irène Richmond-Ahoua, a member of the Rotary Club of Abidjan-Bietry, Côte d’Ivoire, served as Rotary’s PolioPlus chair for her country and now helps coordinate immunization activities in West Africa. She is an international communications consultant and worked as an outreach adviser for the United Nations Operation in Côte d’Ivoire. Richmond-Ahoua was recognized by Bill Gates at the 2017 Rotary Convention in Atlanta for her role in polio eradication and peace. "Volunteering has brought me much happiness, and some tears. It has allowed me to see the world through different lenses," Richmond-Ahoua said. "We must believe in what we are doing regardless of the challenges we will face." She adds: "And my greatest reward? The smile of a mother after her childr has just been immunized." Danielle De La Fuente, a member of the Rotary Club of Coronado Binacional, California, USA, is co-founder of The Amal Alliance. The nonprofit group empowers refugee children around the world through social development and educational programs. She worked at the National Defense University in Washington, D.C., where she fostered good relations across the Middle East South Asia. De La Fuente told the audience that 65 million people have been forcibly displaced worldwide, 77 percent of whom are children. "Imagine a world where children have no dreams," De La Fuente said. "That is a reality I choose not to accept." "The need for compassionate people has never been greater than now," she adds. "What is our future if our next generation is unable to dream? I call on all of you to take action and make a difference."